Thinking the idea to be quite fun and very useful at honing yourself to fine tune the details, I'm now contemplating taking up the venture myself. Despite the fact that I despise Twitter. But, because I always like serializing things and drawing them out, I'm going to make a serialized story which will be unraveled in 140 character tweets. I may regret this decision later, and just do short snippets like Tina, but for now I'll try the serial concept first. I'm reflecting on NaNoWriMo, as this past year was my first time giving it a shot. I had been disappointed in myself, a little, mainly in my story. Life had thrown some curve balls in November, unforeseen events, and I had gotten behind early in the game. But I did plow through a healthy amount of my outline, but nearing the end of the month I came to the realization my outline was missing some vital points. Sure, I had plot veins, but no blood running in it. The last thing I did on CAFE DE MORT in November was to revamp my outline a little. Which was a positive way to finish, as it let me know I wasn't done with it. Not yet. There's a new writers group in southern Missouri. There are several writers in the Rolla area (Rolla, St. Robert, Salem, Centerville, etc) that are coming together to learn about publishing and writing, and overall better themselves if possible. Our first official meeting is Saturday, February 16 at the Rolla Public Library in the kids' classroom. This group is called the Writers Coven and is a result of a NaNoWriMo write-in this past November hosted by myself and the Rolla Public Library. Below is the RSVP for this month's meeting. If you are even thinking about coming, please fill out the form below. The topic for the February meeting is Organization & Accountability. The Writers Coven will be meeting once a month, every third Saturday. The time will always be 3pm to 5pm. All topics will be known in advance and are based on the goals the members of the group have for the year. If you are wanting to become a regular, fill out the goals form as well here. 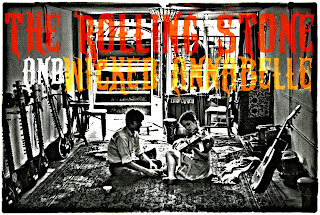 Starting today, I am releasing The Rolling Stone & Wicked Annabelle one chapter per week for six weeks. This latest version of the story has been edited by the ever awesome +Philip Neale, and will be popping up on +Miscelleana Rhinehart's website. Below is her original post sharing the first chapter. If you are on Google+ and want to be notified as each chapter comes out, let me know and I'll put you in a Rolling Stone circle. The story is a bit of a pulpy, punchy piece but with a little bit of heart as well. I hope you enjoy it. Miscelleana Rhinehart3 hours ago I am very happy to present to my fellow Scribes and Reeders, +Nathan Weaver's creative work. He has given me permission to share his story, a chapter a week, over six weeks.